There's just one reprint coming out in December, but it's a good one. In this icy month, a fiery booster pack will swoop in for your Munchkin game. 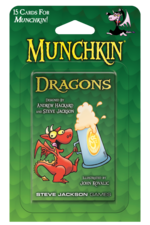 Fun fact: Munchkin Dragons is one of our fastest-selling booster packs. The first two printings were bought up so quickly, we had to bring fans a third! And why wouldn't it be popular? It's an expansion for fantasy Munchkin, and nothing says "fantasy" more clearly than dragons. Whether they're booting short men out of mountains or following Emilia Clarke around, they're an important part in a lot of well-known fantasy properties. Of course Munchkin players want to kill them and take their treasure. And oh, yeah: We should say more about the treasure. A Munchkin supplement about dragons would be utterly incomplete without a hoard of dragon treasure to take once you've felled the fire lizards. So there's plenty of that here, too! The booster has 15 cards, and it's all monsters and treasure, so it can shuffle into any Munchkin game you want. Pick up its companion booster, Munchkin Dragon's Trike, for even more fire power. Then get Munchkin Princesses and Munchkin Knights for a full set of fantastic fantasy boosters!